Delaware lighthouse preservation work ! 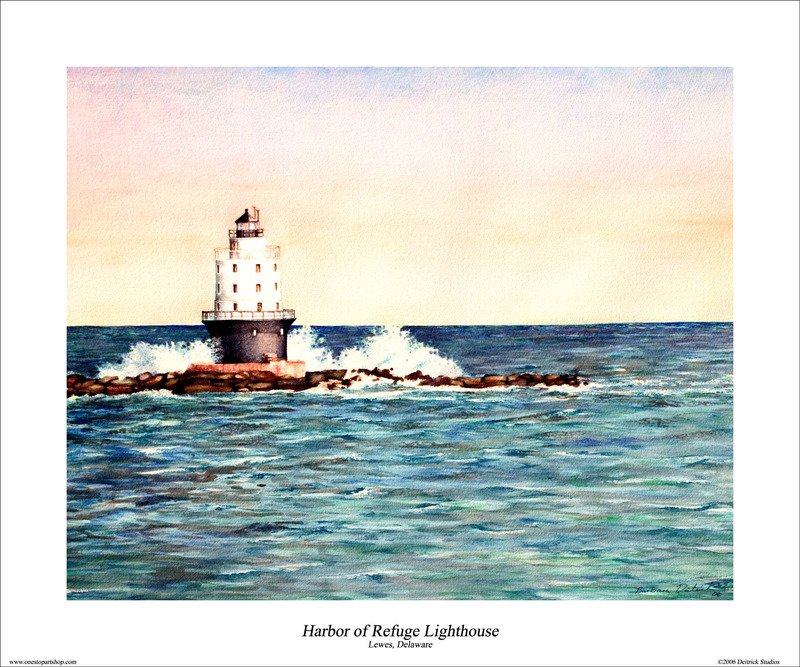 "Harbor of Refuge Lighthouse" by Barbara Deitrick 20" X 24"
Currently three prints are available for sale through the Foundation -- two of Harbor of Refuge Lighthouse and one of Delaware Breakwater East End Lighthouse. Proceeds from the sale of the prints will be split 50-50 between the Foundation and the artists. Chip Deitrick has also volunteered to organize the upcoming "Lighthouse Art Gala" which the Foundation will hold late this coming summer. Chip recruited well-known Delaware artist Abraxas as fellow organizer for the event. Several Foundation members, led by former Board Member Martha Jane Donovan-Burke, will join the artists in planning and implementing the affair. 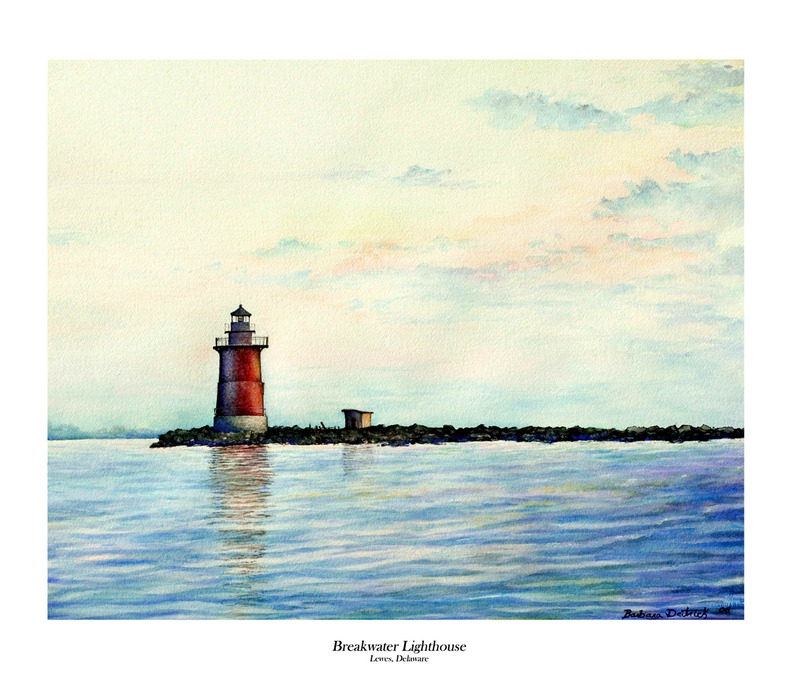 Barbara Deitrick, a water colorist, offers two of her works for sale to benefit preservation work, Harbor of Refuge (above) and Breakwater Light (below). Each is a 20" X 24" print with a 16" X 20" image area. They sell for $95 each, plus shipping, with $47.50 going to the Foundation for each print sold. Arrangements can also be made to pick up the prints and save shipping costs. Chip Deitrick, a photographer, offers a shot of Harbor of Refuge that features the main light on the south end of the breakwater, the entire breakwater washed by heavy seas, and the angle iron tower light on the north end of the breakwater. Printed on heavy duty artists' paper, the limited edition photographic print is 18" X 35", with an image area of 14" X 30.5". It sells for $150 plus shipping, with $75 going to the Foundation for each print sold. NOTE: prints are no longer available, sorry. "Breakwater Light" by Barbara Deitrick 20" X 24"
"Harbor of Refuge" by Chip Deitrick 18" X 35"